Tim, not his real name, normally buys his fireworks in Indiana. This year, due to the economy, he couldn't afford to make the trip. He thought he wouldn't have his own early fireworks show, but a stranger offered to sell him some fireworks. "They were very cheap." Said Tim. "When he said that the launchers were optional, I thought the price was pretty reasonable." Tim bought three, and called his friends for a night of illegal fireworks. After setting off their old stash of fireworks, Tim pulled out the first of his new fireworks. "I was kind of drunk, and I thought we could just light the fuse. But instead it had a button and timer. The timer was written in some odd language. I had some English instructions in the car. So I walked back. As I did, my friend David said all we had to do was push the button and then throw the thing. I laughed, because I thought he was kidding." According to Tim, he heard a faint scream. He turned around and saw a dull red glow. A second or so later, it turned into small flash of white light. As Tim ran towards his friends, he felt a strange taste in his mouth. He could hear his friends scream. When he reached the campsite, he saw a pile of human spaghetti where David once stood. His other friends were dead. "I started to vomit. At first I thought I was disgusted at seeing what happened to my friends. But then I couldn't stop. I thought I was going to die." A short time later, a blue helicopter landed next to him. Several men, wearing blue protective suits scrambled out and started spraying the area with foam. "One of the came up to me and asked me where I got the gamma bomb. I tried to answer, but I was dry heaving. One of the men held up my new fireworks. Then they asked me where I got the micro-black holes. I thought I was crazy." Though Tim's friends were dead, Tim was rushed to Clow UFO base and treated for Gamma Radiation exposure. The doctors explained his fireworks, called Hawking Bombs by humans, are actually devices that compress matter into singularities. These little black holes then evaporate, releasing extreme amounts of gamma radiation. 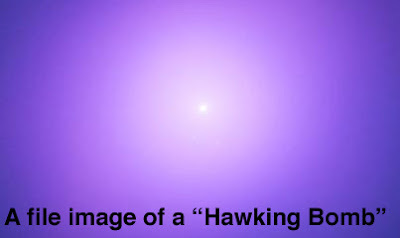 The aliens who make Hawking Bombs can see gamma radiation, and are immune to it. Tim was lucky, but Bolingbrook's Department of Extraterrestrial Affairs is warning all residents not to buy any unusual black market fireworks. "Hawking Bombs, Quantum Tangiers, Dark Energy Sparklers, or any other odd terms." Said Joe Smyth, spokesperson for the department. "Don’t buy them! They're not meant for humans, or even to be used on this planet." While aliens have sold their fireworks in the past, the galactic depression has tempted more of them to risk death by selling these fireworks. Last year, alien fireworks killed two people. This year there have already been 10 deaths, and Bolingbrook officials fear more deaths over the holiday weekend. Three of those deaths occurred in the Beaconridge subdivision. According to Doug, not his real name saw a family playing in their backyard. The father placed a ring on the ground. "A jet of gas or plasma came out of the ring. That poor family didn't stand a chance." Doug said the gas then took on a humanoid form. "It screamed 'Cold!' and started setting the house on fire! I thought it was going to take out the entire subdivision." Instead, two blue fire trucks arrived, and sprayed the creature with a cold gas. This gas repulsed the creature. The Men in Blue managed to drive the creature back to the ring, where it climbed back through the portal it came from. "They started rebuilding the home, and I ran away before they could hit me with their memory altering slaps." Experts consulted by The Babbler believe the family activated a Sunburster, which open a wormhole near the Sun. A sun creature then entered our world through the wormhole. Village officials urge all residents to watch the Village fireworks display on July 4th, instead of buying alien fireworks.